It wasn't until he signed the contract promising him precisely $0 that Chris Smith started to wonder what he was doing. At 25 years old, the right-hander is four years into an uphill climb that's included 15-hour road trips and a terrifying, single-prop-plane flight to tryouts, stints in two independent leagues and the Australian Baseball League and -- on the precipice of a breakthrough -- an arm injury that Yankees head trainer Tim Lentych said he didn't know was possible. And yet, on Monday night, at the end of a pitchers' duel pitting one hurler fresh off a $100,000 signing bonus against the son of a Major League hitting coach, it was Smith -- who's been cut by two independent league franchises and left hanging by another -- who earned the win in his affiliated debut. Smith's name is strewn across the record books at Kentucky Wesleyan, where he shined as an outfielder. The Louisville, Kentucky, native set career records in games played and starts as an outfielder at the Division II school. He was also among the top 10 in school history in runs, hits, triples, total bases, assists and fielding chances. He didn't throw a pitch until his senior year, when he made 15 relief appearances and led the team with eight saves. The graduating Panther had no illusions of playing ball beyond college. His plan was to take his fitness and sports management major, pair that with a graduate degree in sports administration, and see where that took him. Chasing a pro baseball career wasn't even on his mind until his pitching coach, Paxton Gardner, brought it up to him. Gardner insisted on finding Smith a pro tryout, and the day before the right-hander was set to take the GRE, Smith gave Gardner the green light to set something up. "I was on the verge of hanging it up," Smith said. "He said, 'Let me find a workout for you. Let's get you going from there.' I said, 'You get me a workout. I've got the GRE tomorrow, but if something comes up, I'll go for it.'" Gardner threaded Smith into a tryout with the independent Frontier League. Each summer, the league hosts a camp for hundreds of hopefuls. The entry fee in 2010 was $60, and Smith estimated that about 400 players participated. He arrived at 8 a.m. and waited with his dad, Patrick, for his chance to throw, which finally came around 3 p.m. He threw a bullpen session, flashing a fastball in the low-90-mph range and a promising slider. Scouts were impressed, inviting him to return and throw to live hitters in the morning. He was just as sharp the next day. At the end of the tryout, the Frontier League holds a draft, in which each team must select at least two players. With their first pick (seventh overall), the Lake Erie Crushers selected Smith and invited them to their preseason workouts. As Smith came to find out, being drafted by a Frontier League team doesn't ensure a roster spot, even for a first-rounder. At the end of the camp, Lake Erie manager John Massarelli pulled Smith into his office with hesitantly good news. "He said, 'You exceeded our expectations, but to be honest, we don't really keep guys out of that little Frontier League draft thing. But you're a pleasant surprise,'" Smith said. "He said, 'Look, take after some of the older guys, because I know you don't have much experience on the mound.'" Smith made the team as the last man out of the bullpen. He got his first taste of game action Opening Day, when Massarelli threw him into the 10th inning of a tied ballgame. The right-hander promptly loaded the bases, got two outs, then allowed a grand slam. "I had more adrenaline than I'd ever felt in my life," Smith said. "I came back into the dugout, sat down and the pitching coach, Chris Steinborn, said, 'Hey, welcome to pro ball.'" The outing was Smith's last with the Crushers; the team released him at the end of the opening homestand. "I came up to my locker ready to go on the road," he said. "I started asking guys, 'Where are my [batting practice] shorts and my [batting practice] top?' They took that and they took my travel bag, and then it hit me. 'Oh, OK, they're releasing me.'" A few minutes later, Massarelli confirmed Smith's suspicions, officially cutting him loose. "I was devastated," Smith said. "They didn't want me. I'd never had that feeling before. I felt like I'd been on top of every team I'd played on since Little League. To hear them say they didn't want me, I just never wanted to feel that feeling again." The right-hander returned home to Kentucky, figuring for the second time that his baseball career was over. He took a job as a fitness consultant, recruiting clients on a commission basis at a local gym. He lifted weights and stayed in shape but stopped throwing, operating under the assumption that his baseball days were over. Near the end of the summer, he got a phone call from another Frontier League team -- the Traverse City Beach Bums. The Bums had beaten Smith on Opening Day with that grand slam, so Smith was surprised by their interest. The team asked if Smith would trek out for a tryout in November, and Smith obliged eagerly. He threw a bullpen for the Traverse City staff in Indianapolis, and the team signed him to a deal for the 2011 season on the spot. Smith arrived at Spring Training the next season, eager to reward the Beach Bums for their confidence. When he showed up, he found that the team had penned roughly 40 pitchers to contracts that offseason and only planned to keep around 10 of them. Initially disheartened, Smith pitched well enough to earn one of the final spots, making the roster as a long reliever. Smith threw 3 1/3 innings and posted an 18.89 ERA in the first few weeks of the season before being released again. "At that point, I was like, 'Okay, I guess pro baseball just isn't for me,'" he said. It was the third time Smith thought his playing days were over. But shortly after announcing his plans to retire on social media, though, Smith got another phone call. This one was from the White Sands PupFish of the Pecos League -- a lower-level independent league founded in 2010 and based in the Southwest. Smith viewed his adventure to his tryout in Alamogordo, New Mexico, as something of a bad omen. The hurler flew into Phoenix's Sky Harbor Airport, where he was supposed to catch a New Mexico Airlines flight directly to Alamogordo. In Phoenix, he searched the departures board for the gate for his flight, only to find his plane wasn't at the terminal. He was directed out of the terminal toward a phone outside, where he was instructed to check in by punching in a code on the phone. He was directed to his single-prop, nine-seater plane that was rolling down the runway. As he approached, the pilot asked to weigh him and his luggage to determine where he and his bags could be placed without throwing off the plane's balance. He was the only passenger that day. "I saw the plane roll up on the runway, and I'm like 'Oh, my God,'" he said. "It was like a plane off of Toy Story, a little matchbox jet." Smith could see directly into the cockpit, and the pilot pointed out a small screen indicating wind patterns. It was a calm green color, something the pilot said was a positive sign. Smith fell asleep shortly after take off only to be jolted awake by what he described as a sudden "nose dive" that dropped the plane's elevation by a few hundred feet. When the plane leveled off, Smith looked back at the wind radar and saw it was awash with reds and yellows. Out the front of the window, he saw the storm clouds gathering, awaiting Smith and the two pilots over the desert. "I looked at the pilot, and he was grabbing the dash and they were looking at each other while the plane was rumbling," Smith said. "I thought, 'We're going down. We're going down in the middle of the desert, and nobody will know it.'" The plane made more similar nose dives, but the pilots -- a pair of 23-year-olds just a year older than Smith -- managed to keep the prop plane in the air until they landed. A taxi was waiting for Smith when the plane touched down in Alamogordo. The driver got out to help Smith with his bags. "Where are you from?" the cabbie asked Smith. "Well, welcome to hell," the driver said. The next day, Smith threw for members of the White Sands' staff and impressed the PupFish enough to get a unique contract offer. "The manager came up to me and showed me the contract for $0," Smith said. "He said I would get some money every week but said I'd have to earn my money. "I said to my mom and dad, 'They're going to sign me for $0. Should I really do this?' They said to stick with it, that it'd be okay." With his parents' backing, Smith signed on to pitch in relief. He made a few appearances out of the PupFish 'pen. He soon discovered that, in the Pecos League, the weekly salary for relievers was $50, but starters made $70 per week. Having harnessed better control of his wipeout slider, Smith worked up the courage to ask for a raise. "I decided I could really use the extra $20," Smith said. "So I said I'd like to try starting. Especially in indy ball, you get more looks if you're a starter." In his first outing, Smith said he hurled a complete game with thirteen strikeouts. He worked his record up to 4-0, and then in August, the Frontier League came calling again. This time, he was contacted by the Washington Wild Things, located just outside Pittsburgh. The Wild Things needed a sixth starter and had seen Smith's numbers. They also remembered having faced Smith earlier in the season when he was still with Traverse City. Smith jumped to Washington eagerly and made six appearances, including five starts, with a 4.50 ERA. That offseason, Smith was offered his first tryout with an affiliated team. He and his uncle, Ted Mills, drove 15 hours to Port Charlotte, Florida, for a look with the Tampa Bay Rays. A Rays scout offered some encouragement but ultimately passed. So in 2012, Smith returned as a member of the Wild Things. Having finally logged some innings, Smith had turned his slider into a swing-and-miss pitch. Washington plugged him back into the rotation, and he managed a 2.92 ERA in 19 starts, finishing second in the league with 116 strikeouts. "It went by so fast for me," he said. "It was so much fun. I finally felt comfortable with an organization." Having finally established himself as a professional pitcher of some worth, Smith decided to parlay his success into a winter league gig. He went to the Wild Things' manager, Chris Bando, to ask if he had any connections to winter ball, and Bando called up David Nilsson, an Australian baseball player who'd been an All-Star with the Brewers in 1999. Nilsson helped Smith get a job in Australia for that winter. Smith hopped on a plane -- this one a commercial jet -- about two weeks after finishing the Frontier League season and joined up with the Pine Hills Lightning. 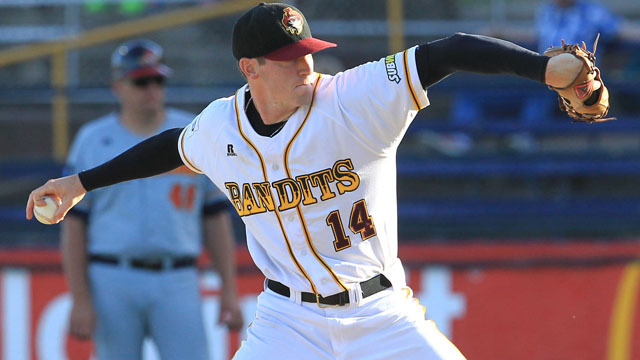 He logged about 50 innings with the club squad, and from there, the Brisbane Bandits penned him to an Australian Baseball League deal and plugged him into their rotation. Smith went 3-3 with a 2.31 ERA in nine starts, posting 65 strikeouts and seven walks over 50 2/3 innings. His success caught the eyes of scouts from the Rockies and Astros, both of whom talked to him about potentially signing for the 2013 season. Eventually, the Astros' scout committed, telling Smith, "We're going to sign you. We really like you." The scout took Smith and his family to breakfast and filled them with hope. In his next outing, Smith set an ABL record by striking out 15 Melbourne Aces in a 4-0 shutout. His elation was short lived. "The next day, the Astros' scout came up to me and said, 'Hey, we're bringing too many arms to Spring Training already," Smith said. "'So sorry, but good luck to you.'" Smith said the news "shattered" him, but he wasn't left dejected for long. A week later, the Yankees touched base, and in January 2013, they signed Smith to his first affiliated contract. Smith didn't get much in the way of a signing bonus with the Yankees. He didn't realize at the time, but the best thing he got was access to first-rate medical treatment. His venture to Australia was a blessing in many ways, but there was one major drawback. In 2011, Smith threw about 50 innings, but in 2012-13, he spiked to roughly 230 frames, all packed between mid-May and early January. Smith reported to the Yankees' Tampa Bay Spring Training complex in February of 2013 eager to begin his affiliated career, but his arm had had enough. In chasing his dreams in Pennsylvania and Australia, Smith had developed a stress fracture in his forearm that cost him the entire 2013 season. "Our head trainer [Tim Lentych] said he'd never even heard of the injury [happening to a pitcher]," Smith said. "That set me out all last year. At first, they said I could possibly come back at six weeks, but then it wasn't healed. Then it was 10 weeks, but it still wasn't healed all the way. By the 12th week, they said they could let me start throwing, but by then, it was already August." Smith never made it onto the mound in 2013. He returned home in the offseason knowing he'd come back to Spring Training this year with another crack at an affiliated gig. He pitched well in camp but was sent to extended spring training so the team could monitor his innings and health. On May 10, a spot opened in the Charleston bullpen, and Smith was called up from extended to fill it. Two days later, at the end of a pitchers' duel between Savannah's Kevin McGowan -- a 2013 13th-rounder signed for $100,000 -- and Charleston's Jaron Long -- son of Yankees hitting coach Kevin Long -- Smith was called upon in a scoreless game. Just like with Lake Erie in 2010, Smith made his debut as a reliever in a tied game in extra innings. The RiverDogs' reliever faced two batters in the top of the 10th and, this time, struck out both. In the bottom of the frame, Michael O'Neill earned a bases loaded walk to give Charleston -- and Smith -- the win. "It's a special night for me," Smith said. "I've been around to quite a few places. ... It's been a long road to get here." Smith is likely to remain in the bullpen going forward. There, his fastball, which still sits in the low 90s, and his slider could provide him an extended career in affiliated baseball. "Right now, he's going to be a reliever for us," Charleston pitching coach Carlos Chantres said. "I've only seen him for 10 pitches, to be honest. ... What I saw was two quality sliders. He struck out one hitter with it. It has some depth to it." Smith said he relishes late-inning relief duty, and though he's open to any role the Yankees will throw his way, he'd love to work in a setup or closer role. Chantres couldn't commit to that just yet but did say he saw the potential for Smith to fill that role in Charleston. As far up the mountain as he's climbed, Smith is perhaps just hitting the steepest slope. Twenty-five-year-old relievers in the South Atlantic League aren't prized prospects, and Smith's well aware of that. So long as anybody's willing to give him a uniform, though, Smith is ready to stick with it. He's come too far to quit. "I'm the oldest person here, but I don't care," he said. "I'm fortunate enough to be here. In independent ball, you see all kinds of players. I have so many friends in independent ball that would kill to be in my spot, and I think about those guys every day."